Slim, ergonomic design and grippable texture to go wherever you need to go. Pump a week’s worth of power into two devices simultaneously. 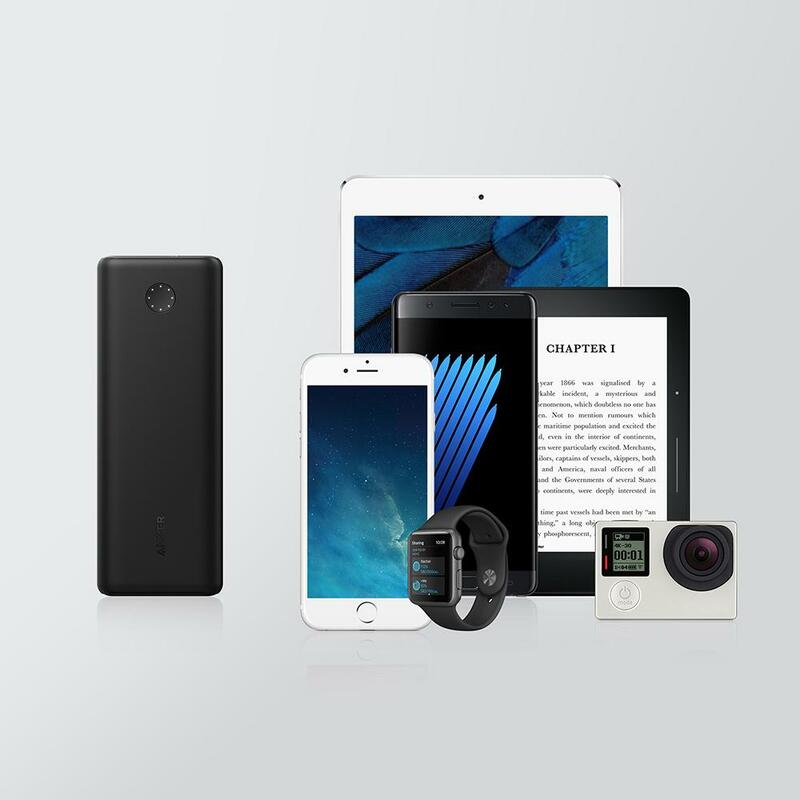 Advanced charging technology ensures the fastest possible charge for almost any device. Access unrivaled charging speeds—for Apple, Quick Charge, and more—with PowerIQ 2.0, the newest generation of Anker's advanced smart-charging technology. PowerIQ 2.0 adapts to your device's unique charging protocol to deliver a tailored, blazing-fast charge. Brimming with 20000mAh of pure power—enough to keep an iPhone 7 running for a week. You'll wonder how you ever spent so much time plugged into the wall. PowerIQ 2.0 is now multidirectional, allowing PowerCore to take advantage of rapid input charging. Get fully juiced up in as little as 5 hours, and spend more time away from the outlet. Find out how much power you have remaining by pressing the slick 8-light LED wheel, or by plugging a device into an output port. Can I use a USB cable other than the one that came with PowerCore II 20000? Yes, other cables can be used to charge your devices with PowerCore II 20000. However, to ensure compatibility and the best possible performance, we strongly recommend using your device’s original (OEM) cable, a third-party certified (MFI) cable, or the included cable. What kind of wall charger should I use to charge PowerCore II 20000? You can safely recharge your PowerCore in 5 hours using a quick charge charger. Lower output chargers (such as some phone chargers) will not charge as quickly or reliably. What devices are compatible with PowerCore II 20000? The PowerCore II 20000 is compatible with Android, Apple and almost all other devices charged via USB except for iPod nano, iPod Classic, HP TouchPad, Asus tablets and some GPS and Bluetooth devices. Does PowerCore II 20000 work with the new iPhone 8 and iPhone 8 Plus? Yes, PowerCore II 20000 can charge the new iPhone 8 and iPhone 8 Plus faster than the OEM wall charger , but an Apple charging cable is not included. Use your device's original (OEM) cable or purchase a third-party certified (MFI) cable separately. What's the output efficiency of PowerCore II 20000? PowerCore II 20000's output efficiency is 60%-70%. Approximately 30% to 40% of the battery capacity is unable to be used because of efficiency complications that affect all electronic devices. These include power lost from circuit heat and voltage conversions from the battery, the charging cable and your device. Can PowerCore II 20000 charge other devices while it is being charged? No, we have disabled this feature due to the detrimental effects it has on the lifespan of portable chargers. My device charges at 1 Amp, will PowerCore II 20000's higher output harm it? No, the PowerCore II 20000 will only supply the maximum output current necessary to charge your device. 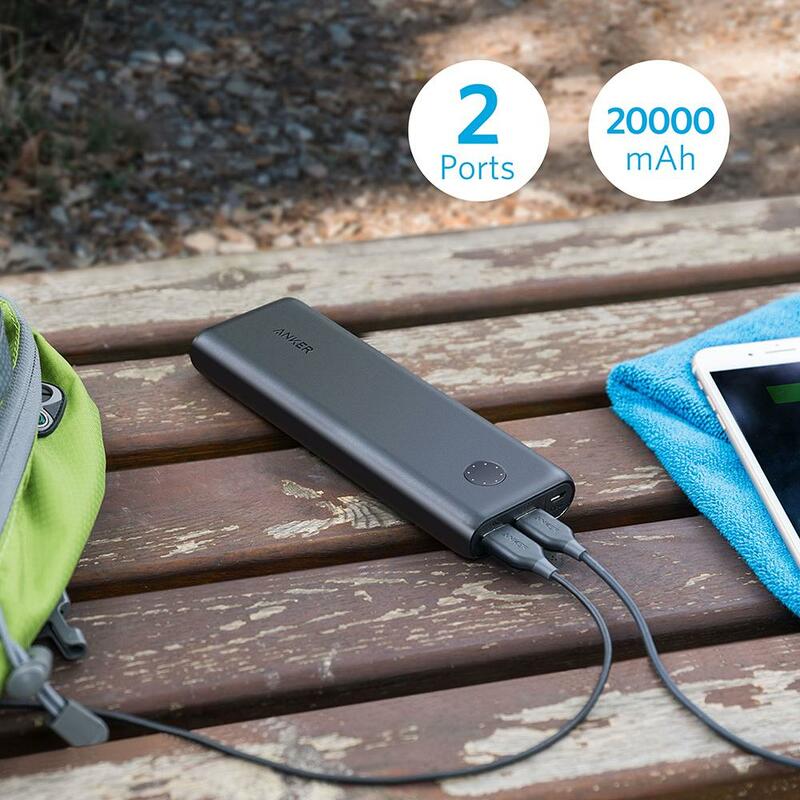 Can PowerCore II 20000 charge two devices simultaneously? How long will the charge in PowerCore II 20000 last without being used? Generally, our external batteries' static power consumption is so low it would take between 20 and 36 months to drain completely. However, it is also worth noting that their chemicals will become less active if left unused for extended periods. To extend battery lifespan, discharge and recharge it at least once every 4 months. Can PowerCore II 20000 be used for international travel? Yes, PowerCore II 20000 can be used internationally. Just be sure that your USB wall charger is compatible with the voltage of the country you're travelling to. The input voltage of an adapter is usually labeled on the adapter itself. Can PowerCore II 20000 be taken on board airplanes? Yes, all external batteries with a capacity lower than 27027mAh (100 watt hours) can legally and safely be taken on board airplanes. To calculate an external battery's capacity in watt hours: (Battery mAh Capacity X 3.7)/1000. Effective January 1, 2008: Passengers may carry consumer-sized lithium ion batteries (a.k.a. 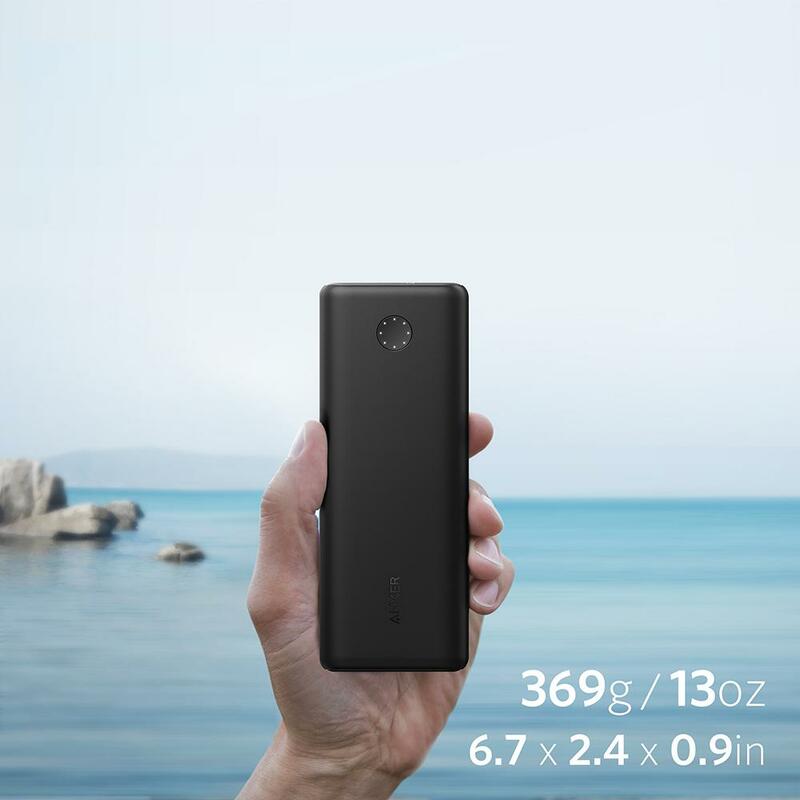 rechargeable lithium, lithium polymer, LIPO, secondary lithium) with no more than 8 grams of equivalent lithium content or 100 watt hours (wh) per battery. This size covers AA, AAA, 9-volt, cell phone, PDA, camera, camcorder, Gameboy, and standard laptop computer batteries. Passengers can also bring two (2) larger lithium ion batteries (more than 8 grams, up to 25 grams of equivalent lithium content per battery) in their carry-on. This size covers larger extended-life laptop batteries. Most consumer lithium ion batteries are below this size. What should I do if PowerCore II 20000 doesn't recharge? What should I do if PowerCore II 20000 doesn't charge other devices? Please try using a different charging cable between PowerCore II 20000 and your device. Email us at support@anker.com during your 18-month warranty period if this doesn't fix the issue. What do the LEDs indicate when powercore II 20000 is charging itself or other devices? "When PowerCore II 20000 is charging your device, the LED power meter will stay on, displaying the battery’s remaining power. The light will fade when the device is fully charged and no longer drawing a current. The last LED light will flash when the remaing power is lower than 10% and turn off when lower than 5%. When PowerCore II 20000 is being charged, the LEDs will flash and light up one by one to show the progress of the recharge. They will turn off when the PowerCore is fully charged.